Four-day-old pup nursing. You can see the tongue—this shows proper latch-on. The pups can be so strong that when the Dam stands up, they can hang on and get dragged out of the box; make sure your box prevents this. At this stage, it is important to check for swollen teats, and make sure you put a pup on the full teats to prevent mastitis, an excess of milk that may cause the dam to become restless and uncomfortable. She may refuse to nurse her pups. You may need to draw off a little milk first to relieve the pressure, unless it is SO swollen and hot, hard and red and you think mastitis has set in. Mastitis is an infection of the milk gland. If you suspect mastitis, see mastitis page. It is a myth to not put the pups on the infected teat. Call your vet as soon as possible, as in advanced stages you will need an antibiotic. You will need to massage and drain the teat. Pups should start gaining right away—0 to 20 grams the first day. Watch for puppies whose weight goes down. 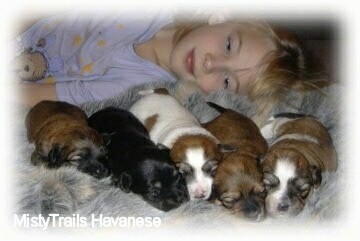 Pups should double their birth weight at eight to 11 days. Remember the nutritional requirements of the dam while nursing are very high. It is wise to add vitamins to the diet with larger litters, and keep the dam on high quality puppy food. A lack of fluids in the diet will lower her milk supply, so make sure there is always fresh water available. In the first three to four weeks, the dam will totally care for the puppies. She will feed them clean them and clean up after them. Keep puppy nails trimmed so they do not tear at the dam with sharp claw tips. The dam may develop diarrhea, this is often from cleaning up puppy waste. A call to the vet is recommended in case it is something more serious, but usually a dose of Pepto-Bismol or two will really help. Still...call your vet for his advice and dosage. The dam's discharge is usually gone by 2 weeks, but can last up to 8 weeks. 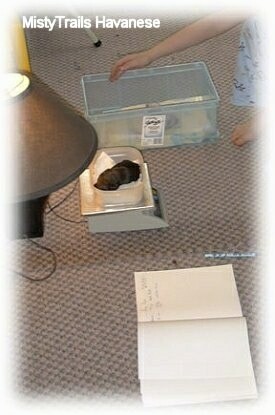 Pups should be weighed twice daily for the first few days. 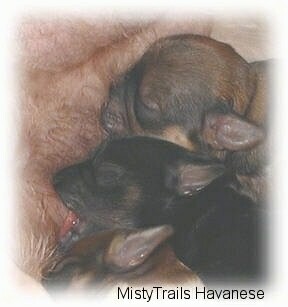 Put the pups that are slower gainers on the teats, for a head start put the smaller pups on the larger teats. If there are five pups and eight teats, then a few times a day you can make sure the smaller puppies get to drain two teats. If you do not do this, then the big puppies ALWAYS get two teats, and gain weight even more rapidly. It is intervening, but it works very well to pick up the slower puppies. 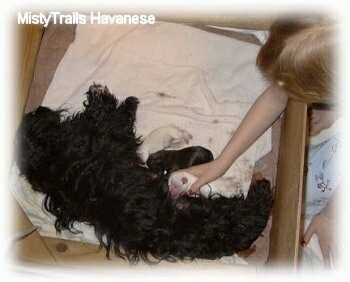 After the birth, the dam's hair always falls out while she is raising a litter. Up to 60% of it can fall out, but normally 40% does. It likely happens to help cool them; this is normal and it can come out in chunks. If too much hair falls out too fast, she could be lacking something in her diet. Sometimes you will not notice much hair at all come out. Some lose it gradually, some suddenly. 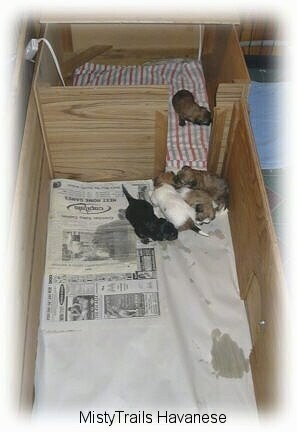 Pups at one week; all pups have doubled their birth weights, all are equally thriving. The whelping box is only good for the first three weeks, then they need a mini home which includes potty station and of course a play area too. They are now ready to start being housetrained using the Misty Method. Breeders that use the Misty Method teach their pups the concept of housetraining before they leave for their new homes. At three weeks, the pups are becoming more mobile. The door from the whelping box has been removed, and they are beginning to venture out to explore and relieve themselves on a papered area twice the size of their whelp box. At this time, I keep the bed clean and smelling fresh, and only change the paper outside minimally. They learn to go outside to eliminate very quickly, as by day 21 they have developed their sense of smell, and will start to discriminate where to relieve themselves. They can now eliminate without stimulation, but the dam should still continue to clean up after them. They are beginning to play a little with themselves and littermates, and are becoming more aware of their environment, and slightly vocal. I hear the odd attempt at a bark. I will add toys this week (no Beanie Babies or buttoned toys). At this time teeth can begin to erupt and they can begin to lap liquids, so I will also add a shallow dish of water. These wire racks are for making boxes or shelves. They also work great for enclosures for puppies. Check your local super store for availability. Idea courtesy of MistyTrails Havanese. These racks are GREAT because you can quickly step in and out without a gate, and the dam can usually jump in and out to tend to her puppies, but the puppies cannot get out. Notice the nifty doggie door in the back left of this picture. Perfect for potty training and for the dam. You can also make them higher for older or larger puppies.